Dr. Owusu stumbled into dentistry and fell madly in love with it! 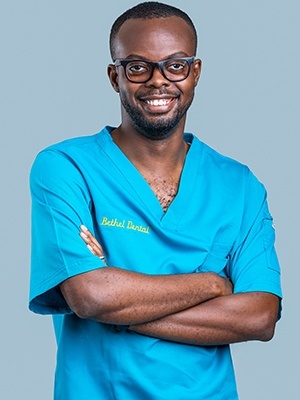 He received his dental education at the University of Ghana School of Medicine and Dentistry, where he graduated with a degree in Dental Surgery. During this time, he also attended an externship as the prestigious King’s College Dental School in the UK. He later specialized as an Oral and Maxillofacial Surgeon and therefore qualified as a member of the Ghana College of Physicians and Surgeons. He also had a two-year modular course in implantology that was organized by the University of Frankfurt in Germany under the auspices of the Ahmadiya Mission in Ghana. In July of 2018, he attended a Dental 3D Printing and Treatment Planning Training in Basel, Switzerland that was organized by the International Association of Craniomaxillofacial Surgeons. Dr. Owusu loves to read in his free time and is a long-suffering Arsenal fan. Locally, Kumasi Asante Kotoko is his darling football club. What motivates him to get out of bed each day and come to Bethel Dental is the chance to relieve pain and restore smiles. He enjoys the regular interaction with patients, learning about their expectations, and doing everything possible to meet them. He lives in Accra with his wife Ewurama, who is a lecturer and researcher at the University of Ghana College of Health Sciences, and their two kids named Daasebre and Awuraba.